Whether or not you use data mining to support your internet marketing campagns depends on your budget and if your focus is technology or customer behaviour patterns. Typically data mining looks at historical data, hence the term mining, and if you believe that your product will continue to be purchased by similar customers in similar patterns then this is the solution for you. Data mining vendors include; Microsoft, SAS, IBM, Oracle, SAP in the top tier and plenty in the next level down. If you believe that the market is always moving then focus on behaviour patterns starting with your customers and then look outwards with surveys, sales rep updates, internet social media and Twitter blog posts. Of course this is not data mining but rather content ‘aligning’ where you look at the behaviours that your products support and customer perspectives of the value and used of your products. Looking at blogs and Tweets keeps you in tune with the market and complements how you sell to current customers based on their historical buying patterns (old school data mining) and when you competitors introduce a new promotion or product you can see the impact on your customers if you combine data mining and aligning. On the technology side you can do quite a lot with Excel2010 and simple sorting. To go further add ACCESS or SQL. The other data mining technologies export to Excel so this approach starts with the simple and adds complexity as needed. Be aware that it may take you longer to assess the complex solutions that to build an effective simple one. First perform a keyword ‘analysis’ of your product content, your websites and blogs (including Twitter) and the customer behaviours that you notice–start with blog posts. Second align the keywords from Customer, Product and Content perspectives. Third search for customers in your data with the keywords that decide are crticial for your next internet marketing campaign. This is a quick description of ‘Resonance Marketing’ and Resonance is the core of Twitters new advertising model–Resonance is about ‘aligning’ as opposed to mining and while the two are complementary your customers, market and budget will determine which is better for you. In our experience ‘aligning’ works better and faster with new products or adjusting ‘in-process’ marketing or advertising campaigns. Data mining typically doesn’t include INFLUENCERS or thought leaders who can influence your customers and sales. Adding thought leaders to your CRM and marketing campaigns is one opportunity that many neglect. We have posted a couple of refernce links below and additonal exemplars are on our two Twitter streams and associated SpeedSynch internet marketing software blogs. http://wp.me/pBsXX-6h Though Leader ‘how-to’ overview. http:/speedsynch.wordpress.com Analyics and Social Media Behaviour patterns for internet marketing. Twitter looks like an old school Radio Network if you think about Twitter feeds or streams as radio stations and the Twits that Tweet station managers–by the way I Tweet too. Twitter wants to make you a Radio Star. Twitter, and I, believe that advertisers should pay more for Tweets that go further and are visible longer. The stories attached to the long lasting, high quality Tweets are there because the Twitterverse believes that they are valueable. What do you do when you see a ‘cool’ Tweet? I measure it–figure out if it helps me now or might help me later. The help means can it provide value, whatever that means to me. Value includes passing on to others or Re-Tweets, RT to Twits everywhere and of course messages of ‘thanks’ are often received from the Twits whose Tweets are Re-Tweeted. Though Twitter’s focus is the time and distance Tweet’s travel when they measure Resonance you should consider that each Tweet has its own CONTENT RESONANCE and each Twit, ok blogger or author, has their own BLOG RESONANCE. Twitter changes so quickly that the old way of shaping web sites and blogs for search engine spider visibility or SEO is now obsolete. Yes, it will still be done and yes it will justify an invoice to a business owner but the search engines will slowly ignore the old ways and this starte May and June of this year with Google’s CAFFEINE algorithm and will accelarate as Google deploys Semantic SEO. This is the Twitter feed of a recent follower @SpeedSynch where I created Semantic SEO Reports with SpeedSynch our internet marketing tools and software to understand the BLOG RESONANCE @BlueTrainSEO. Note that this report is only from Tweets on the first Twitter page and created 2010.08.20 so if you look at the site now it will be different. Contact us about Twitter Resonance measures and analytics to help you boost your Social Media and Internet visibility. The new Twitter ‘Resonance’ advertising model makes it imperative for you to understand why corporations have a difficult time with Tweets as they are generated by people they don’t know and can’t influence. The insipiration for this post came from this post How Companies Should Approach the New Twitter Advertising Model which is important to know as now ‘New Twitter Advertising Rules’ contains some of its resonance. If someone called Twitter and ordered advertising after reading this post then “How Companies Should Approach the New Twitter Advertising Model” is the root cause of the purchase. My semantic blog illustrates how Google, BING and Yahoo are forced to switch from using SEO keywords phrases to Semantic Themes because the blogs swamp the pitiful amount of corporate content on the internet. Twitter has made the imperative to move to semantics stronger and Googles recent purchase of Freebase from Metaweb puts them in a position to move faster than the rest. Semantic meaning lets you track Tweets and blog posts to determine IF there is a concept that is carried from Influencers to follower–NOT RETWEETS but rather the meaning. I didn’t Tweet or RE-TWEET the blog post “How Companies Should Approach the New Twitter Advertising Model” but I did employ some of the meaning. Can you guess which meaning elements are here? I will post about it soon! Twitter provides value that Google or other search engines and Social Media platforms can’t copy, real time competitive analysis window to their users or community members so that it is possible to see what is on their mind now. It is important to note that Search Engine Spiders, the software robots that travel all web sites that receive them, cannot access all the content of the Social Media sites as it is protected as an asset and indeed it is used to convince both Users aka Community Members and Advertisers alike that their brand and social media space is unique and worth the visit and advertising investment. Semantic SEO is about to change this value measure and the corporations that depend on it. Semantic SEO is being used by Google, BING and Yahoo as a competitive advantage and shifts the concept of SEO or Search Engine Optimization from a keyword orientation to meanings understood by the words typed into a search engine and the relationship of those words to content on corporate and social media sites. The shift from word combinations to meaning will change the internet. Consider the example of ‘cool fresh water’ and the meaning it conveys to someone who is thirsty as a result of playing football, hockey or any other sport. 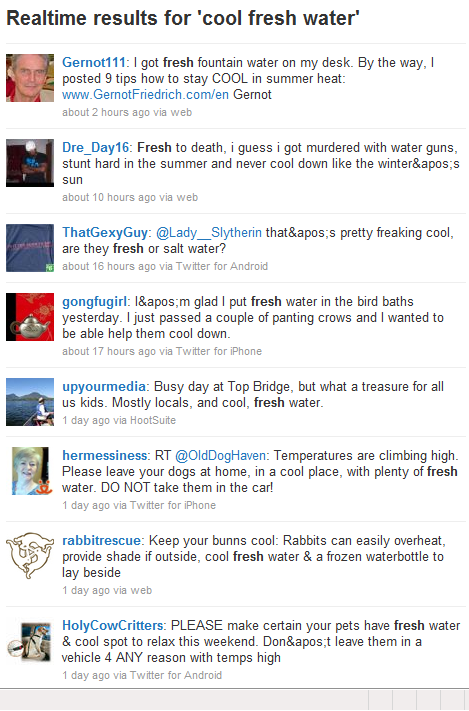 In the Americas a search for ‘cool fresh water’ will find content related to PET STORES! Why? The top positions on the Google SERP or search engine results page are determined by content relevance and volume according to ‘backlinks’ or the links created in content in other web sites that ‘point’ to the sites shown in Google’s SERP. Pet stores may not be the answer that most people ‘mean’ when they type ‘cool fresh water’ into a search engine and yet according to current SEO practices and measures that is the result that Google with all of its sophisticated algorithms deems to supply. If you we thirsty because of playing a sport or hiking in the mountains or because of visiting the desert as a tourist the Google search results would not be very helpful but the Twitter search results are very short and you can quickly scan and compare your perspective to the perspectives of the people who Tweeted or posted comments. Showing multiple perspectives is much more valuable that offering thousands or millions of results that start with Pet Stores. Twitter and the other Social Media platforms, including LinkedIN, is the reason that over half of searches on the internet now start in social media platforms. SEO value has shifted from the search engines, Google and others, and the rules of SEO have changed. Since searchers may have multiple perspectives when they search ‘cool fresh water’ we use the concept of a mask to describe each perspective. Any searcher can put on one or more masks that reflect their perspective of meaning of the words ‘cool fresh water’. One mask or Neuropersona mask indicates what they are looking for in a result for their search. Find the right mask and you can find any searcher who wears that mask. Building the correct Neuropersona mask lets you find any searcher who’s immediate needs are reflected in the content that is used to build the mask and the content is built with stories important to searchers. See how masks are built here and an overview here. 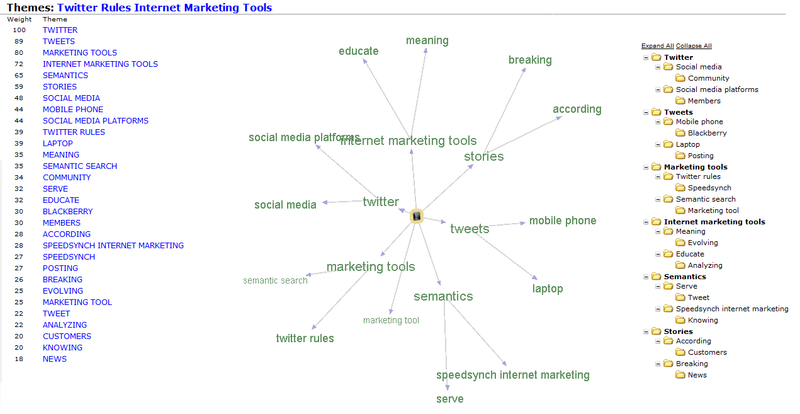 We use SpeedSynch internet marketing tools software to build the semantic maps below to illustrate how web sites are static and change much more slowly that Twitter feeds or streams. People tend to update Twitter faster and this behaviour reflects what is on their minds NOW rather than what was on their web sites 3 or 6 months ago when they updated their website. Twitter is NOW. * Double click on image below to enlarge. Note the difference between Twitter words and Web site words! Build Tweets that reflect the immediate need of searchers and you will dominate relevance and not need SEO investments that require months to implement. In the months that you invest in PPC and SEO searcher needs will change and so will Twitter. It is easy to see why Twitter rules other internet marketing tools after watching how media reporters and producers use Twitter. They must deal with slowly changing and awkward business models, conform to internet marketing demands that content be optimized for search engines and deliver a highly readable, entertaining and engaging product called news. Typically enticing search engine spiders to content is performed by search engine professionals who don’t have the burden of readability and in this commentary we explore how Twitter is used to deliver stories across the internet at large much like reporters and the media companies that they serve. We also consider the how and why of semantic meaning’s impact on the stories delivered via Twitter as the search market speeds towards Semantic Search and Semantic SEO. For those who are experienced with Twitter look at the story rules and internet marketing tools for innovative ideas. The #journatchat video below offers practical and proven ideas and new perspectives from experienced Twitter users to inspire you and illustrates new internet marketing tools that enhance the value that you or your company receives from investing in Twitter. Gathered, adopted and created new content to fit format of Semantic SEO Reports. Created Semantic SEO Reports with SpeedSynch Internet Marketing Software Tools. 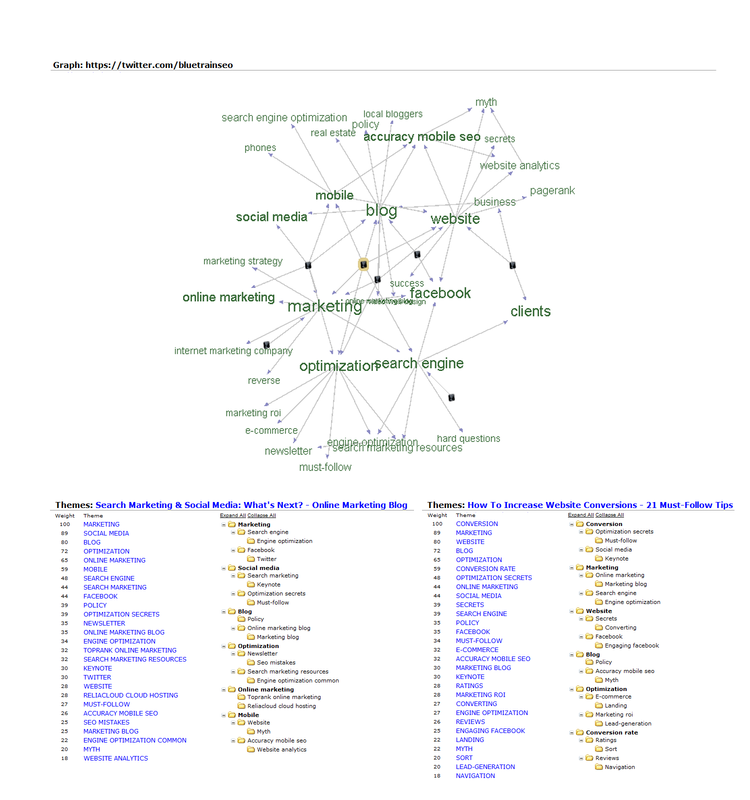 Edited this blog post until the second Semantic SEO Reports firt our Competitive Analysis. * ‘Before and After’ Semantic SEO Reports at the end of this post. Today there are literally hundreds of Twitter ‘how-to’ guides available whether you are new to Twitter or want to understand how professionals use Twitter daily. In my experience the best way to learn Twitter is to use it according to your work objective which sets the rules to follow. First I signed up for one personal and another company account to learn both perspectives at once. I Tweeted from one account to the other to see how things worked and looked at reports. First I looked for people or companies I know for Twitter users to ‘follow’. Then I looked for trending topics and news on the Twitter home pages and got comfortable enough to copy how and when experienced people Tweeted. Finally I looked for Twitter ‘how-to’ books and internet topics to provide me with the perspectives to understand the Twitter processes that fit my work. This initial stage might take you a couple of days, weeks or months and you should strive for comfort both in using Twitter and how to post from the internet with a laptop or from your Blackberry or iPod or whatever device you have. The way you get your message to Twitter is one step and the story is the other. Tweets benefit from semantic SEO to deliver value from viewer perspectives. Tweets Educate by telling how or why something is done or done differently. Tweets Indicate when changes happens or when we must measure differently. Tell the whole story in 140 characters, no links. Tell part of the story and include links to content on blogs or people links. Point to people or blogs and add value perspectives to help searchers. Storytelling on Twitter is different that blogs and other forms of storytelling because of the simple 140 characters restriction for each Tweet. This limit should not worry you as a lot may be said with 50 characters or less and each Tweet may include one or more links to other documents or blogs to add detail and texture to each Tweet. Delivery of stories is the core value of Twitter and the flexibility of connecting people and outside data makes it very easy to support the new SEO or semantic search engine optimization currently being implemented by Google and other search engines in the form of semantic search algorithms. Stories are the currency of Twitter and stories find people directly and indirectly by being Re-Tweeted or RT and by being read in the Social Media platforms who display Tweets like this WordPress blog or LinkedIN. The brilliance of the 140 character story size is the ability for other Social Media platforms to handle the quantities for their own users without needing to duplicate the high cost and complexity of the Twitter software platform and hardward architecture. Stories attach to people who add perspectives to identify opportunities related to sales, customer service, innovation or just community participation. Once opportunities are assessed then the people that can exploit them run with the story. Essentially the stories on Twitter mine opportunities first and then the opportunities mine people. In the quickly evolving story of the Semantic Web SEO professionals must now change how they work by shifting from keyword phrases to keyword semantic themes as search engines will soon evaluate search engine rank according to the meanings of words according to how they are meant by users. Any words used in similar spaces or context will be deemed to share the same meaning. This is drastically different than the current SEO approach and it may be that your next social media expert, the one who will be fluent in semantic search, will be a journalist. Tweet your Story to other Social Media platforms. Deliver your Story so that it can be Re-Tweeted or re-told later. Connect your Tweets to your Blogs and Social Media Platforms. Help visitors to your Web or Social Media sites Tweet or Follow you. All social media platforms of any worth now have Twitter options that allows their members to post what they Tweet into their blog or community spaced and to write and post Tweets into Twitter from their community spaces. As a member of other Social Media platforms I look to see how Twitter is connected with each as I visit and once I see how others use Twitter I look to FAQs or ask in groups how I might do the same. WordPress recently added a Twitter button! SpeedSynch.com and my other blogs now have Twitter! My main goal for using Twitter is to introduct our SpeedSynch internet marketing tool to help companies cope with the next generation of SEO, Semantic search. These 5 Twitter rules are specifically aimed at educating people as the why they must act now rather than wait on the rest of the market to adapt to semantic search, why SpeedSynch semantic marketing tools create value quickly and samples of instant SEO Reports. This is a hard task considering that SEO or search engine optimization has changed little in ten years and now Google is quickly moving from word combinations to thematic meaning for blog content and to evaluate the value of links and backlinks. Select a Product name with Semantic SEO potential. Use Twitter to Educate and Indicate to add value to current or future customer need. Engage stories first, then add semantic meaning and finally deliver them to people. Monitor changes in the semantic meaning of stories to predict behaviour changes. Twitter matters and so much so that NBC the news and TV conglomerate has integrated Twitter into their daily operations. There reporters and producers use Twitter every day to find breaking stories, to build back-stories, day-after stories today and this video of a #journat LIVE with NBC interview is worthwhile for every Twitter user to see, at least once. Twitter is the internet marketing tools for finding breaking news according to NBC and it will help you educate and indicate with stories whether it is to your family, friends, company or customers. There are other tools that complement Twitter by creating or viewing Tweets better or faster and analyzing who Tweets and what they say. When you search for Twitter software tools you will find millions of pages which takes us back to the technique of finding out what works for others and limiting our focus to the work that we have to accomplish. Exploit Twitter for Competitive Analysis. Rank Higher with Semantic SEO Reports to add meaning to content and backlinks. This is the short story of what I did and what I do to go to market with Twitter and remember that you need may be different. You cant go wrong with an investment in Twitter and I’ve added a link to the #journchat video for you. ** Click twice to open and enlarge impage or zoom with your browser. 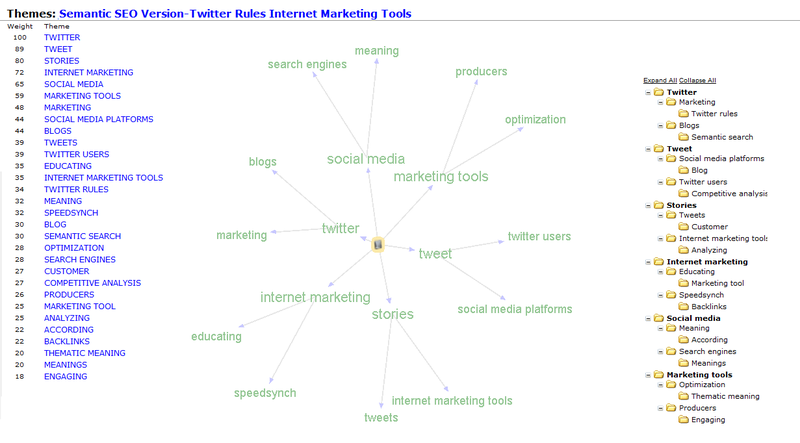 'Original or Before' modifying "Twitter Rules Internet Marketing Tools"
The semantic map below is from the original ‘Twitter Rules Internet Marketing Tools’ blog post. The blog post was adjusted three or four times to ensure the proper semantic signature to also correspond with SEO for current and future semantic algorithms. — ‘second day story’ GIVES A TOPIC LEGS but TODAY! News sources are evolving and a big question! Look for what are different people saying?! NBC not using FourSquare or Gowalla CAN’T get exclusives! Haven’t worked out value to news consumers yet. Know when and how to pitch the RIGHT person–check source CISION?! Non-profits and NGOs or non-governmental organizations face difficult times fundraising today, whether its the economy or a steadily increasing difficulty in getting messages to the people who have an affinity with their goals, and Googles transition to semantic search may be helpful. It seems the rules of internet marketing are changing faster than non-profits and NGOs in their adoption of the technology to get their message out to community members to mobilize action and this is understandable. Non-profits take pride in their work and their communities and typically value stable relationships that are long term, all of the things which the internet is not. Relationships on the internet can be consumated or destroyed with the click of a button or the clack of a typists fingures on the latest netbook and Google’s new semantic search may be the ideal way to synchronize the long term orientation of non-profits or NGO’s to the extremely short term orientation of the content makers and most searchers on the internet. 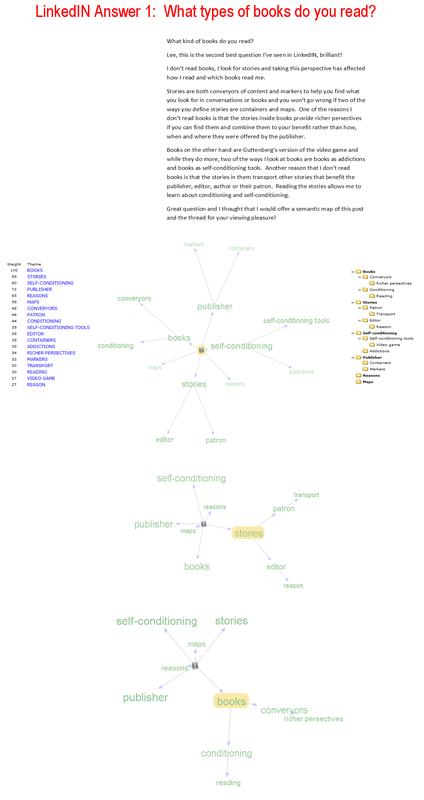 This semantic map of Jeffrey Bradach’s ‘Scaling Impact’ helps identify what is seen by search engine spiders that now employ semantic search algorithms. There is a simple way to make Jeffrey’s or Stanford’s or your non-profit or NGO posts visible and it is called search engine optimization or SEO. However, you can’t just Google or BING “SEO classes” as the rules have changed this month and will change event faster. Indeed the old style SEO, last weeks secrets, now are good for entertainment value as Google is moving faster to Semantic SEO especially with the purchase of Metaweb last month. Social Media vs Google, will Semantic Search help? Semantic usually refers to the study of meaning and the Semantic Web is a term coined by W3 is meant to describe the tools and techniques needed to add meaning to the content on the internet rather than a thing. This is an important distinction to keep in mind. Semantic SEO is the natural progression of SEO or Search Engine Optimization and a shift to creating value from words to using concepts which is critical as there is so much content, text, images, audio and vido to sort through on the internet before your find what you need. Google needs new mojo to fight off social media and with the Metaweb acquisition it looks like semantic search is Google’s choice and it should be the choice of your non-profit or NGO too. LinkedIN Answers and Semantic SEO is the future of search. “What types of books do you read?” is a simple question on LinkedIN Answers that illustrates why LinkedIN and Semantic SEO is the future of search and even better “What types of books do you read?” had attracted ‘human’ searchers which led to another question–can we use this simple question to attract search engines spiders? As I looked at the simple question in the LinkedIN Answer forum I realized that the people who had responded to the question had varying interests and experience, abd tge fact that so many interesting people with diverse interests had been attracted to respond to this simple question intrigued me so much that it inspired me to build the semantic blog post below which is specifically designed to attract a search engine spider’s need to find a semantic algorithm. If you want or need your blog to be seen by search engines and ranked highly then keyword stuffing and building hundreds or thousands of backlinks may have worked before but semantic SEO is the future. For blog visibility you must now include text and other content that fits the semantic meanding of searchers rather than text searchers enter into search engines. As you search the internet today you, like most of the people in the world since early 2009, will probably start in a Social Media platform like WordPress, LinkedIN, Twitter, Youtube or Facebook. A search engine is probably your second choice and for Google, BING and Yahoo this is a problem and a threat to their business models, so they must improve their service and find a way to give you what you need better, faster and cooler. Enter the search engine spider and the semantic search. The search engine giants are quickly improving their search algorithms and providing their spiders the ability to understand the semantic meaning of a blog post or other web site content. Once the spiders understand the semantic meaning of your blog post then they check their huge databases to find content with similar semantic meaning and associate your blog post with the keywords used by human searchers who have ‘voted’ the content as the Answer to their Question which started as keywords typed into a search windows. Search engine spiders now determine the search words used to find your blog post or web site, not your words or tags or backlinks or even what you think your words mean. 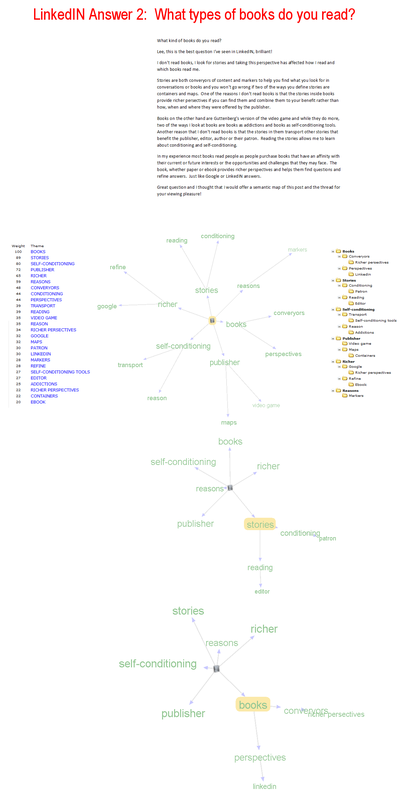 This is my first answer to “What types of books do you read?” and the semantic map is below this initial answer. Lee, this is the second best question I’ve seen in LinkedIN, brilliant! I don’t read books, I look for stories and taking this perspective has affected how I read and which books read me. Stories are both converyors of content and markers to help you find what you look for in conversations or books and you won’t go wrong if two of the ways you define stories are containers and maps. One of the reasons I don’t read books is that the stories inside books provide richer persectives if you can find them and combine them to your benefit rather than how, when and where they were offered by the publisher. Books on the other hand are Guttenberg’s version of the video game and while they do more, two of the ways I look at books are books as addictions and books as self-conditioning tools. Another reason that I don’t read books is that the stories in them transport other stories that benefit the publisher, editor, author or their patron. Reading the stories allows me to learn about conditioning and self-conditioning. Great question and I thought that I would offer a semantic map of this post and the thread for your viewing pleasure! My second answer shows I adjusted the text and how search spiders see the post now. 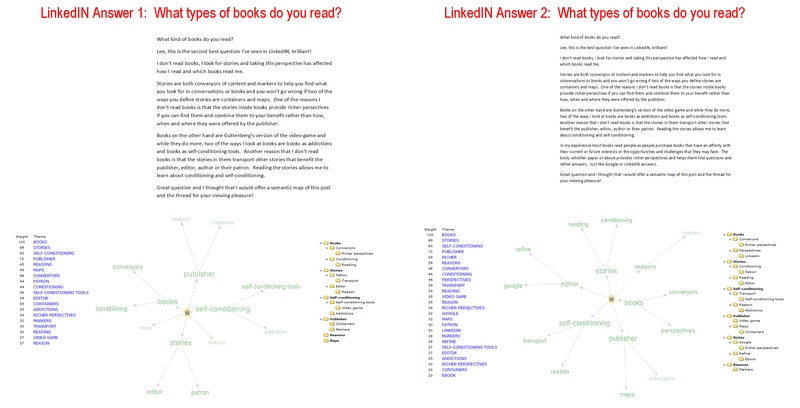 * Note to SEO Professionals: Look at all 3 Semantic SEO maps for a LinkedIN connection. Lee, this is the best question I’ve seen in LinkedIN, brilliant! In my experience most books read people as people purchase books that have an affinity with their current or future interests or the opportunities and challenges that they may face. The book, whether paper or ebook provides richer perspectives and helps them find questions and refine answers. Just like Google or LinkedIN answers. 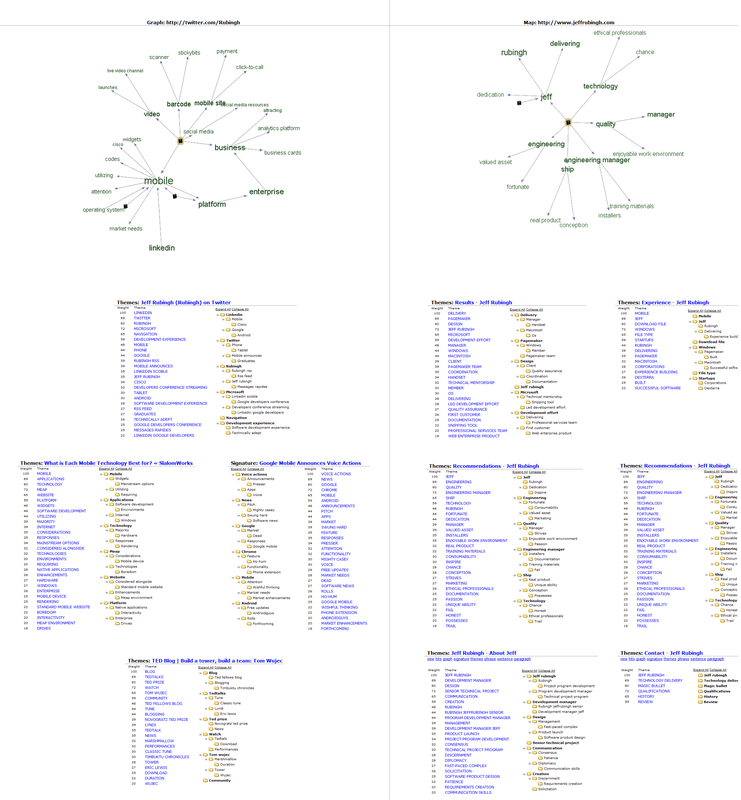 Here is a comparison of both Semantic SEO maps created by SpeedSynch Internet Marketing Software. LinkedIN Answers is a fast way to understand what is top of mind for the people in LinkedIN and the LinkedIN Answers forum provides response to question that are rich in meaning and offer a superb context to explore semantic SEO. Semantic SEO is the future of search and it is here now. Facebook’s ‘semantic secret’ is the use of avery small number of categories to help their community members navigatethe massive amounts of community generated content. While using categories this way appears contrary to the notion of ‘semantic’ which is highly academic and generally precise in methodology. The two approachs provide value that complements both and the difference is one of perspective rather than effectiveness. Facebook takes the perspectives of the community they serve while Google and academics appear to take the command and control perspective of ‘we know best’. Story told 2 times is a Process — to ensure compliance. Story told 3 times becomes Software — to accelerate process. Story told 4 times becomes Brand — to establish property rights. Story told 5 times becomes Measure — to evaluate and manage ROI. In my experience on one side of a story lens are the storytellers and artists and on the other side accountants and engineers. 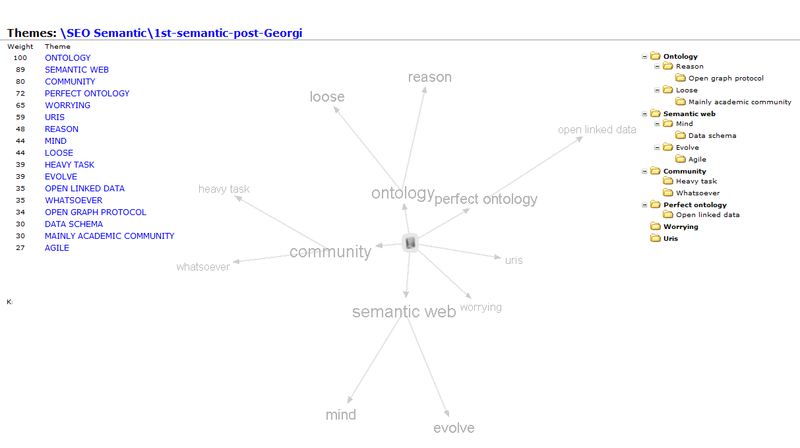 This is the SpeedSynch map of Georgi’s ‘un-semantic’ blog conversation that I quoted above. To make money sell the Semantic Web as a product rather than the processes and techniques required to add meaning to the content found in the internet. Sell Ontology as business pays handsomely for precision. To help people sell stories and they are the self-adjusting mechanism that keeps navigation and value relevant when the perspectives of searchers and suppliers of content change. Our SpeedSynch product is a combination of semantic software designed at internet marketing software and a technique that we call Neuropersona or semantic behaviour mask that lets us understand needs of people who search the internet for meaning or content.